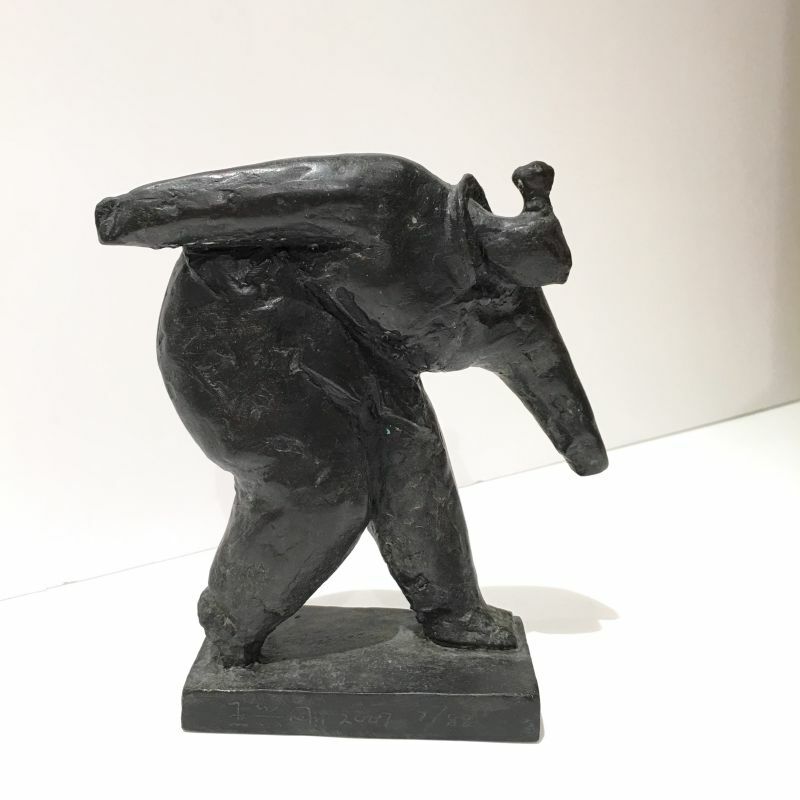 Wang's sculpture is a reflection of the fast moving circumstances surrounding contemporary society in the People's Republic of China. Wang splits his time between creating sculpture and teaching at Beijing University. His works are a commentary on contemporary Chinese society and the loss of individuality between the demands of work and personal life. 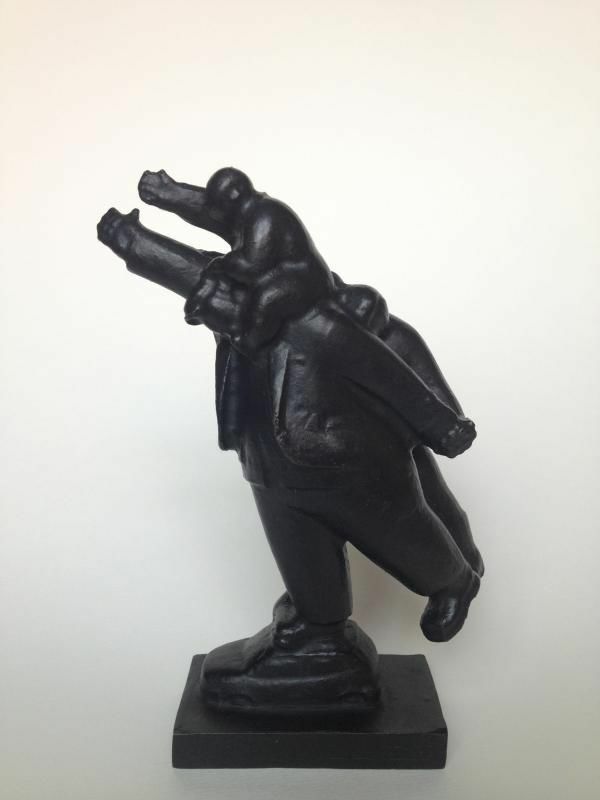 Wang specializes in sculpting peasants as a reflection of the speedy progress of the Chinese society - forgetting the simple and plain individuals still found in the rural areas of the nation. He emphasizes on the modernization of China, prevalence of contemporary trends and loss of individuality between the demands of work and personal life. Unlike his peers, Wang's focus on rural subjects makes him standout. 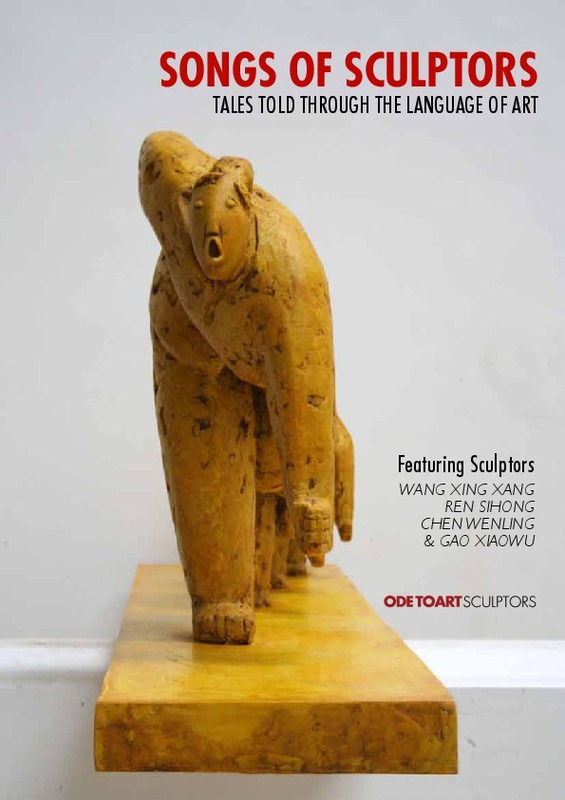 With his ability to come up with the appropriate blend of both contemporary arts and the topic of countryside in his sculptures, Wang shows his audience his attachment and understanding towards Chinese peasants as well as being able to connect with the modernizing generation. He makes use of his practical experiences and cultural pondering of many years ignite his awareness on the negligence or oversight of those serious problems in the contemporary arts field. In this view, he initiatively chooses and shoulders this cultural responsibility, confines his vision on this field, and focuses on those peasants who are fringed by the urbanization tide. One of the vital transitions of Chinese contemporary fine arts in 1990s is the transfer of visual field---from the perspective of countryside to city, which is more or less related to cultural context transfer. As the drive of willpower of striving for powerful modernization from government as well as from folks, overall developing mode transferred, the focus moved to city, urbanization of countryside, metropolisization of urban city, the booming economy permeated with the ushering of information network and culture globalization. The rapid expansion of urban city and strengthening of citizen society brings out flourish of urban culture, elicits and attracts many unprecedented cultural problems as well. As a result, the city gradually becomes the focus of public attention. The city topics pursued by new generation at the beginning of 90s increasingly become the mainstream of Chinese contemporary arts. Those artists who are being keen on the transition of culture pattern diverted to urbanized creation spontaneously, accordingly, their experiences developed from purely sensitive to abstruse, and increasingly became diversified and microcosmic. Nowadays, the tendency is becoming even more heating. 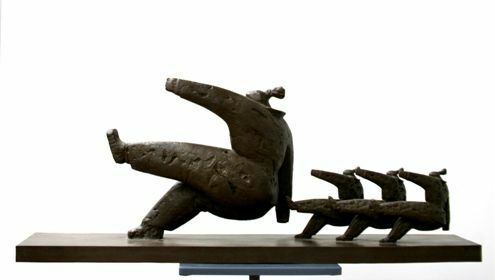 However, the sculptures of Wang Xinggang always focus on simple and plain peasants, all this appear to be an obvious deviation from the contemporary Chinese arts. Yet being distinct from those artists who take countryside as their topic whereas caring nothing on contemporary arts, Wang Xinggang has always being the central area of contemporary arts, he is not only familiar with the channel of contemporary arts development, but also can actively get involved in it. As for that, his choice is urged by his personal cultural notion, driven by his affection to countryside and peasants. Superficially, along with the dominant position of urbanization and consuming culture, countryside and peasants has nothing to do with the main field which contemporary arts is concerned with. Accordingly, Wang Xinggang almost falls into isolation. Whereas few contrasts and comparison could make us be aware of the overlapping of agricultural, industrial, post-industrial society under typical social historical background nowadays in China, the enormous economic income gap among different cities, different regions, and different industries, and the gap are being expanded. Due to substantial capital input, policy support, geographical advantage, etc., only a small number of cities developed rapidly, and could be matched with international metropolis. In those developed city, the emergence of pre-consuming society idea, pervasion of consuming culture have become an un-debated fact. Whereas neither this pervasion nor the consuming culture is restricted to the wealthy stratification of those developed cities, the antenna of consuming culture has expanded, permeated to overall regions, including remote and backward places. Therefore, although the countryside in China does not belong to single type of consuming, the consuming culture has long been dominant in this area. Those countryside groups who pursue ideal consuming will highly identify with consuming culture despite of consuming incompetence caused by the economic restriction, meanwhile, they will try to pursue and imitate the practical lifestyle of consuming groups regardless of personal or social economic status, pay the price for the desperate imitation, and even inhibit and sacrifice their basic necessary gratification. China boasts with large number of peasants, which takes up around three fourth among total population. Needless to mention, they are lying on the lowest stratification of social pyramid, whereas from certain perspective, it is those very lowest groups who function as footstone for various advancements and evolution. However, there is less concern, or we may say in great shortage, on social, cultural contextualized countryside field as well as serious problems emerged from peasant group. The artist, Wang Xinggang, who was born in northeastern China bears sincere affection and certain understanding to Chinese peasants, his practical experiences and cultural pondering of many years ignites his awareness on the negligence or oversight of those serious problems in contemporary arts field. In this view, Wang Xinggang initiatively chooses and shoulders this cultural responsibility, confines his vision on this field, focus on those peasants who are fringed by urbanization tide. However, the topic of peasants not only takes leading position in the past visual schema but also presents in contemporary visual products, or even being prevalent everywhere. But it has either been garnished in order to meet the demand of urban civilian's sightseeing taste on countryside landscape works or been falsified in the persistent on-the-way thematic culture. Therefore, Wang Xingang's sincere concern and deep presentation must be based on the clear distinction from garnishing and falsifying. Through his works, we may find that he started from the perspective of contemporary arts background, initiated his observation and thinking on the value appealing and mentality of peasants under contemporary cultural context. As the modernity of spontaneous and voluntary cultural selection, its footstone is individualistic and dominating. But the prevalent footstone in China is conformism-oriented, which is in lack of dominating peculiarity. During the tide of modernization, the description and norm of those dominating culture have always been well set, and the peasants have been chessman who are manipulated and driven by certain authoritative speech. The blind imitation has been the major symptom, and this blind imitation in itself is passive to its end. 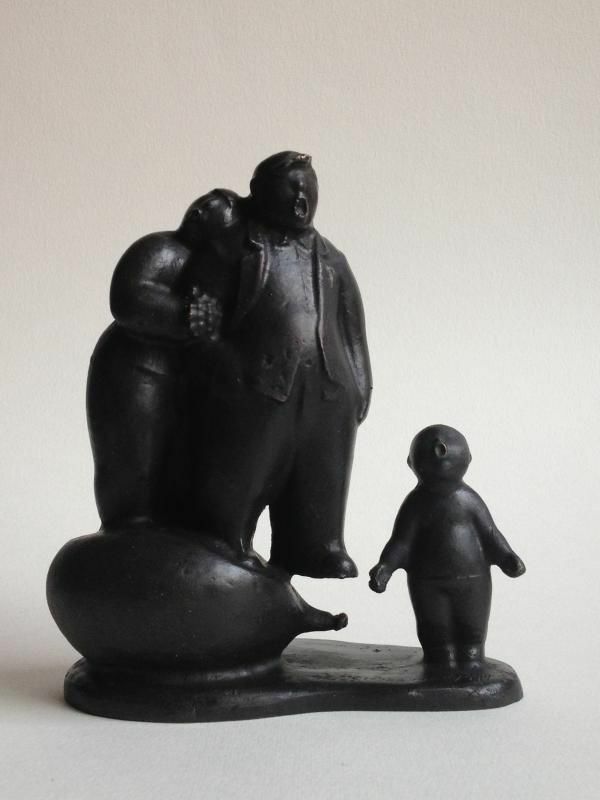 After many years, perception and contemplation, Wang Xinggang realizes this major symptom of peasants, which is manifested in his sculpture works. He adopts symbolic language to present those peasants. The waded jacket, cotton trousers remained unchanged hundreds of years, together with liberation shoes produced after the founding of P.R. China, present the life status of peasants who bears strong pre-modernization farming atmosphere, the fallen earth traces of deliberate scratching, piling, together with the Earth Property intensified by the khaki coating, embody their intimate relation with the land or life and death, also reveal the ¡°land¡± complex of the sculptor who is sentimentally attached to the land. He absorbed the sculpt concept of upholding the gist while deleting the minutia, restoring the noble style and being simplistic, emphasizing the momentum, rhyme, and body block so as to give prominence to verve. Accordingly, he adopted the technique of exaggeration, transfiguration, while describing other aspects at only few strokes. By this way, the blind public-oriented mentality driven by dominating consuming culture is standing out. 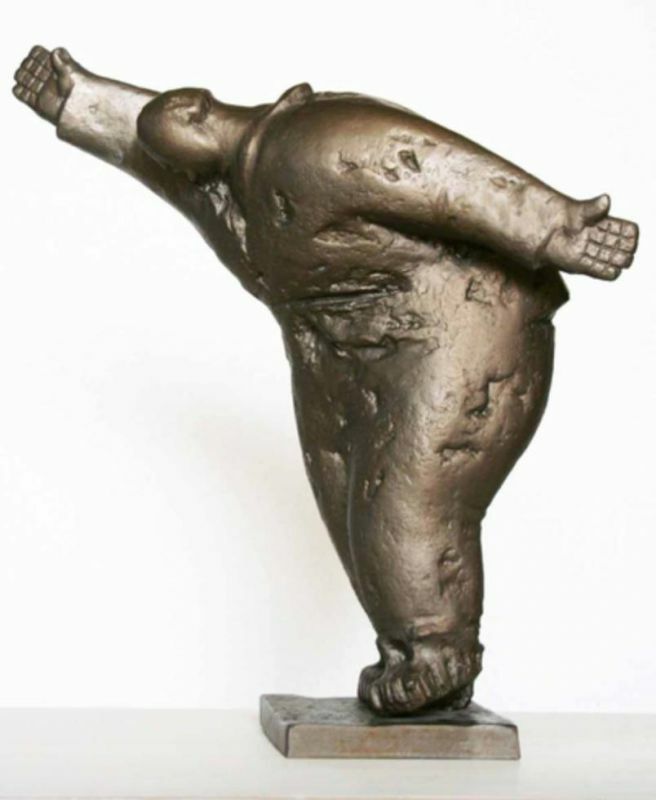 Through his sculpture we may find, those perplexed peasants who are driven by the triggering desire are moving forward in step and following their common lead. Whereas the most surprising point is that even the pacemaker peasant who stands in the foremost frontage is all the same bewildered. Thus when the pacemaker peasant gets stumbled and fallen, all the followers will encounter the same destiny correspondingly. The works of Wang Xinggang, are actually the symbolic description of the blind behavior leading by conformism consciousness. Under the contemporary cultural context, his works actually gears to the peasants who are surrounded by consuming culture atmosphere. While on the process of deduction and expansion, the consciousness which lacks dominating property is not restricted to consuming culture atmosphere only, but being blind following of every dominating culture. It is not restricted to contemporary peasants, but most probably exists among other groups, including every inspector as well. Modernity is a kind of plan based on today's imagination to the future, but whether the super plan turns out to be utopia or future reality will depend on the transient on-the-spot action of the participant, depend on the subject. If we say personality determines one's action, action determines one's destiny, then for those blind followers, what the destiny will be?